It’s been a tough season for the Flourmen and their inevitable relegation was confirmed after they slipped to a 1-0 defeat at Peterborough Northern Star. 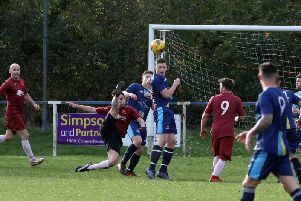 Rothwell Corinthians now have a six-point advantage over second-from-bottom Kirby Muxloe after they shared a 1-1 draw with Harborough Town in the local derby at Sergeants Lawn. Corinthians took an early lead through Jordan Henson but they were denied by a last-gasp Aaron Preston goal in the third minute of stoppage-time. There was disappointment for Desborough Town and Wellingborough Town as they slipped to 1-0 and 2-0 home defeats to Pinchbeck United and Oadby Town respectively. Raunds Town’s impressive revival continued as they moved out of the bottom two of Division One. A second-half Zac Allen penalty was enough to give the Shopmates a 1-0 home success over Sileby Rangers and it sent them a point clear of second-from-bottom Huntingdon Town. Thrapston Town remained rooted to the foot of the table after they were beaten 2-1 by title-chasing Melton Town at Chancery Lane. And Irchester United also came up short against one of the high-flyers as they lost 4-0 to Anstey Nomads at Alfred Street. Elsewhere, Jurelle Philips and Brian Farrell were on target for Burton Park Wanderers in their 2-2 draw with Birstall United Social. And Rushden & Higham United went down 3-1 at Bourne Town after Mason Thomas had given them the lead.